October 9, 2008: A team of internationally renowned astronomers and opticians may have found a way to make "unbelievably large" telescopes on the Moon. "It's so simple," says Ermanno F. Borra, physics professor at the Optics Laboratory of Laval University in Quebec, Canada. "Isaac Newton knew that any liquid, if put into a shallow container and set spinning, naturally assumes a parabolic shape—the same shape needed by a telescope mirror to bring starlight to a focus. This could be the key to making a giant lunar observatory." Borra, who has been studying liquid-mirror telescopes since 1992, and Simon P. "Pete" Worden, now director of NASA Ames Research Center, are members of a team taking the idea for a spin. Right: An artist's concept of a spinning liquid mirror telescope on the Moon. Credit: Univ. of British Columbia. On Earth, a liquid mirror can be made quite smooth and perfect if it its container is kept exactly horizontal and rests on a low-vibration low-friction air bearing that is spun by a synchronous motor having one stable speed. "It doesn't need to spin very fast," says Borra. "The rim of a 4-meter–diameter mirror—the largest I've made in my lab—travels only 3 miles per hour, about the speed of a brisk walk. In the low gravity of the Moon, it would spin even slower." Most liquid-mirror telescopes on Earth have used mercury. Mercury remains molten at room temperature, and it reflects about 75 percent of incoming light, almost as good as silver. The biggest liquid-mirror telescope on Earth, the Large Zenith Telescope operated by the University of British Columbia in Canada, is 6 meters across—a diameter 20 percent larger than the famous 200-inch mirror of the Hale telescope at Palomar Observatory in California. Yet when completed in 2005, the Canadian Palomar-class liquid-mirror telescope cost less than $1 million to build—only a few percent the cost of a solid-mirror telescope of the same diameter--and, for that matter, only a sixth of Palomar's original cost in 1948. Those economics are making astronomers sit up and begin noodling out plans for a lunar observatory. "Our study [with Borra] started when I was still an astronomy professor at the University of Arizona before I came to NASA in 2006," Worden recalls. 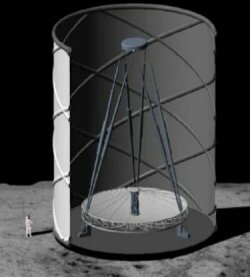 "The real appeal of this approach is that we could get an unbelievably large telescope on the Moon." Mercury is unworkable on the Moon: it's very dense and thus heavy to launch, it's very expensive, and it would evaporate quickly when exposed to the lunar vacuum. In recent years, however, Borra and his colleagues have been experimenting with a class of organic compounds known as ionic liquids. "Ionic liquids are basically molten salts," Borra explains. "Their evaporation rate is almost zero, so they would not vaporize in the lunar vacuum. They can also remain liquid at very low temperatures." He and his colleagues are now seeking to synthesize ionic liquids that remain molten even at liquid-nitrogen temperatures. Much less dense than mercury, ionic liquids are only slightly denser than water. Although not highly reflective themselves, a spinning mirror of an ionic liquid can be coated with an ultrathin layer of silver just as if it were a solid mirror. Weirdest of all, the silver layer is so thin—only 50 to 100 nanometers—that it actually solidifies. In the vacuum of space, a liquid mirror coated with a thin solid layer of silver would neither evaporate nor tarnish. A liquid mirror can't be tilted away from the horizontal because the fluid would pour out, destroying the mirror. But that does not mean a liquid mirror telescope cannot be pointed. Optical designers are now experimenting with ways of electromechanically warping secondary mirrors suspended above a liquid mirror—or even slightly warping the liquid mirror itself—to aim at angles away from the vertical. 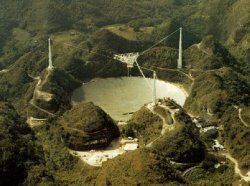 Similar techniques are used to point the great Arecibo radio telescope in Puerto Rico. Furthermore, says Borra, "if the telescope is located anywhere other than exactly at the poles, with each rotation of Earth or Moon it would scan a circular strip of sky. And the rotational axis of the Moon wobbles with a period of 18.6 years; so over a period of 18.6 years, the telescope would actually look at a good-sized region of the sky." Locating a major liquid-mirror telescope near the lunar poles is appealing. The telescope itself could reside near the bottom of a permanently shadowed crater where it would stay at cryogenic temperatures, desirable for the best infrared astronomy. Yet solar panels could be erected on nearby permanently illuminated mountain peaks to generate power to keep the mirror spinning. 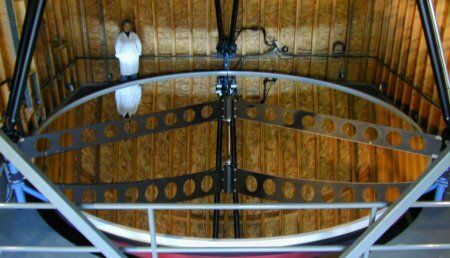 The fact that a liquid-mirror telescope always looks straight up vastly simplifies its construction and reduces mass by eliminating heavy mounts, gearing, and pointing-control systems needed for a steerable telescope. "All you'd need is the liquid-mirror container, which might be an umbrella-like device that self-deploys, plus a nearly frictionless superconducting bearing and its drive motor," Borra says. Worden estimates that all the materials for an entire lunar telescope 20 meters across would be "only a few tons, which could be boosted to the Moon in a single Ares 5 mission in the 2020s." Future telescopes might have mirrors as large as 100 meters in diameter—larger than a football field. "A mirror that large could peer back in time to when the universe was very young, only half a billion years old, when the first generation of stars and galaxies were forming," Borra exclaimed. "Potentially more exciting is pure serendipity: new things we might discover that we just don't expect." Says Worden: "Putting a giant telescope on the Moon has always been an idea of science fiction, but it soon could become fact." An article describing a potential lunar telescope 20 to 100 meters across is "Metal Films Deposited on Liquids and Implications for the Lunar Liquid Mirror Telescope," by Ermanno F. Borra, Omar Seddiki, Roger Angel, Daniel Eisenstein, Paul Hickson, Kenneth R. Seddon and Simon P. Worden Nature vol. 447 (2007), pp. 979-981. An account of the Palomar-class 6-meter telescope built for only about half a million dollars appears in "The Large Zenith Telescope: A 6 m Liquid-Mirror Telescope," by Paul Hickson et al., in the Publications of the Astronomical Society of the Pacific in April 2007 (vol. 119, pp. 444–455). For an account of earlier attempts, see "Liquid Mirror Telescopes: History," by Brad K. Gibson, published in the Journal of the Royal Astronomical Society of Canada (vol. 85, no. 4, pp. 158–171, 1991). Ground-based astronomers at the California Institute of Technology and at other international centers are pursuing concepts for ultralarge astronomical instruments on Earth using liquid-mirror telescopes. Among those is the International Liquid Mirror Telescope project.